¡Una Campaña Accionado por la Gente! I was raised in Oakland and graduated from Oakland Public Schools. I'm also a wife and mother. I hold a Bachelor's Degree in Human Development, a Master’s Degree in Public Administration, and a Teaching Credential. I have a proven track record of leadership, community advocacy and commitment to public service. I have served the citizens of Oakland on the Oakland School Board. I took the District out of State Receivership, left it with a $10 million surplus in 1997, and created quality neighborhood schools. I am a small business owner, educator, and founder/volunteer of Oakland Civic Pride -a youth civic leadership program; and a former nonprofit executive where I created jobs for Oakland residents. As your Councilmember At-Large, I will continue to work to make Oakland a great place to live, work, and grow! I will tackle the issues of public safety, jobs, quality neighborhood schools, recreational services for our youth, business growth, home ownership, and preserving the environment. Allowing Oakland to be the most dangerous city in California is unacceptable. You deserve better. Vote for me on November 6 and I will be your voice at City Hall! Keeping Our Tax Dollars in Oakland! Join our ‘people powered campaign!' 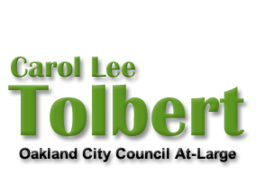 Vote to elect Tolbert on Tuesday, November 6, 2012. You can sign up to volunteer, make a contribution, and encourage your friends and relatives to do the same. Let’s build on our legacy of civic involvement, economic justice and political empowerment. Together, we can make Oakland a great place to live, work and grow. Get involved today!